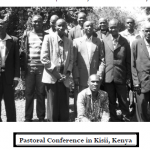 The part-time missionary visit to Kenya this year re-volved around a few main points of emphasis. With only three and a half weeks of total time in-country, there are fewer individual and congregational visits that can take place. The first week was dedicated to the training of semi-nary students and practicing pastors who attend the KCLC (Kenyan Church of the Lutheran Confession) temporary training institution located in Chotororo, Kisii land area. For the time being there are eight students enrolled who meet on a one-week-per-month basis. Their curriculum has been centered largely on Luther’s Small Catechism in conjunction with a study of the fourteen pamphlets. 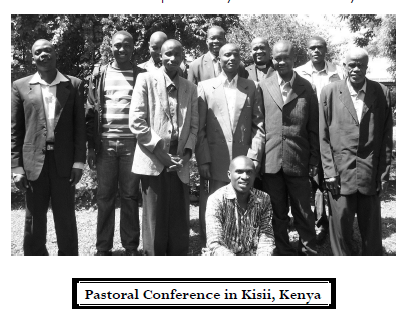 The Kenya/Uganda joint pastoral conference was once again held in Kisii Town, Kenya with 12 men in attend-ance. Everyone was given an opportunity to take an exam on the fundamental teachings of the Lutheran faith. The results of the test showed a great deal of improvement from past years and renewed dedication to study that these servants of the Word have practiced over the last few years. During the second day of the conference everyone presented a sermon for the benefit of all the pastors and for the missionary to have an opportunity to give input and critique their presentation of the Word. The final day of the conference was reserved for the planning session of the ongoing work in Kenya/Uganda. The leaders of these re-spective church bodies formulated short-term and long-term goals and implementation of a plan to accomplish those goals. We were blessed with safe travels and a won-derful time of fellowship and unity for those three days. 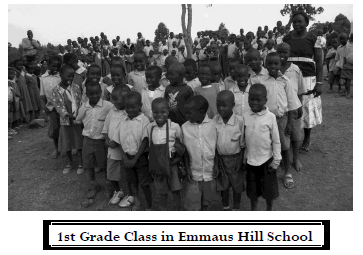 The remaining time was dedicated to the two primary schools in Kenya that are supported by members in the CLC-USA. The issue of high teacher turnover was addressed at St. David’s in Etago, along with seminars designed to familiarize the current faculty and staff with the teachings of the catechism. These sessions were received with great enthusiasm, as many of the teachers come from other church bodies and have not been exposed to a systematic presentation of doctrine. The new classroom recently built through KINSHIP sponsorship has been a tremendous blessing for the students of St. David’s. It is well constructed, with ample space, and proper ventilation. This structure will serve as a place of worship, assembly hall, and multiple classrooms for many years to come. 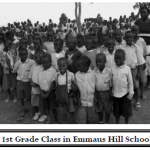 Identical seminars were conducted at Emmaus Hill School in Milimani (Moi’s Bridge). Two of the teachers currently serving this school are members of the church as well and have been confirmed in the catechism. The rest of the faculty also showed great appreciation for this opportunity to study the Word of God together.